Manikaran is a famous pilgrimage center of the Hindus and the Sikhs attracting pilgrims from far and wide throughout the year. Set amidst the refreshing environment at an altitude of 1760 m, Manikaran is sandwiched between the beautiful Vyaas and Parvati rivers in the Kullu district of Himachal Pradesh. The temples, the Gurudwara, the hot springs and the scenic beauty of Manikaran are its famous attractions. Manikaran draws pilgrims from across the country as the hot springs present here are believed to be endowed with medicinal and healing properties. People suffering from different kinds of ailments, especially rheumatism and muscle related problems, come here to get cured. It is believed that a dip in the hot springs can cure such diseases. The hot springs of Manikaran are located at various locations near the banks of the Parbati river. The legend goes that once when Lord Shiva and his consort Goddess Parvati were taking a stroll at a kund in Manikaran, the earring of the goddess fell somewhere. Shesha, the serpent deity found the jewel of the goddess and he moved from there into the earth. Lord Shiva sent his attendants to look for the jewel but when the search ended in vain, Lord Shiva got furious and opened his third eye. He started performing Tandava, the cosmic dance, which symbolized the arrival of a great calamity in the universe. Fearing the consequences of Lord's anger, the serpent deity returned the jewel. Since then the waters of the springs are extremely hot. Manikaran Gurudwara is the holy place where Guru Nanak Dev once came with his disciple Bhai Mardana on his journey around India. The Gurudwara is an important pilgrimage center of the Sikhs. During his stay here, the Guru performed many miracles, which were later recorded in the Janam Sakhi or the 'Autobiography of Bhai Mardana'. Catch the glimpses of the beautiful mountains and hot springs from the Gurudwara. It is believed that a bath in the hot springs opens the path to heaven. 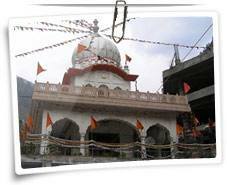 This temple is one of the most famous temples in Manikaran, which has an interesting legend attached to it. According to the legend Lord Rama himself brought this temple from Ayodhya. The temple houses the beautiful idols of Lord Rama and his consort Goddess Sita. Considered to be one of the most holy pithas of the country, Kulant Pith attracts many a devotee. It has a Vishnu Kund, which is considered very sacred. The waters of the Kund is believed to have the power to rid people of their sins. By Air: The nearest airport is Bhuntar located 10 km from Manikaran. By Rail: Pathankot and Chandigarh are the nearest railway stations, which connect it to the cities of Himachal Pradesh. By Road: Manikaran is accessible by road from the cities of Himachal Pradesh and its neighboring states. Manikaran does not offer very good accommodation options. In fact, Kullu and Manali, located near Manikaran, are dotted with several hotels falling into different categories.